We offer eco tours targeting Great White Shark-watching at the historic Farallon Islands a few miles off the coast of San Francisco. The Gulf of the Farallones is a very special place. There's a volume of eco touring photo ops with all of the marine life, and the rugged islands themselves. Head right to the islands. Go around the main islands at least once. Sit in the quiet waters on the downwind side of the island. Everyone looks for shark attacks. Run over to any suspected predatory ativity. Stop for whales while on the way home. Multi-Day Cruising to Ports Of Call during your shark watching trip. Don't miss the shark-watching boat..! Our incredible adventures are on boats certified by the US Coast Guard to be shipshape and seaworthy. Each boat has its own passenger capacity and amenities. Pricing over and above the cost of charter may apply based on the special features of your trip. 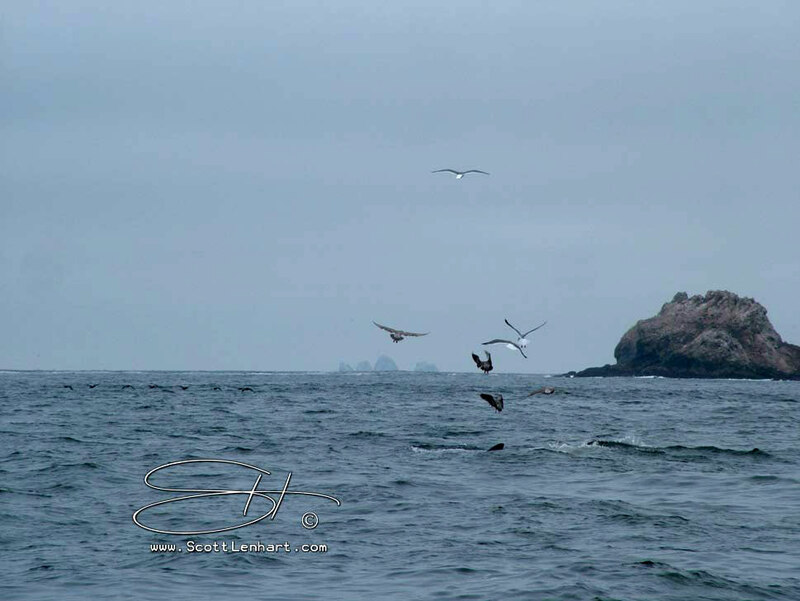 Whale Watching, Sea Lions, Sea Birds & rare species such as Fur Seals or Leatherback Turtles might be spotted on Farallon Islands Eco Tours!